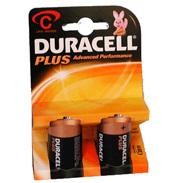 Don’t be caught short on Birthdays and Christmas without having the right batteries! It can be very disappointing opening a gift and not being able to play with it straight away so always check whether batteries are included or not. Most toys these days have some electronic operation which requires battery power to support their functions. It doesn’t harm either to have plenty of supplies in for other household appliances – although you may get a little more exercise changing over the TV channels for a short while if you run out for your remote! 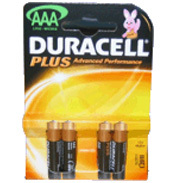 Duracell are a well known and reliable disposable alkaline battery brand which is why we choose to stock their Duracell Plus range. They offer long lasting power for all sorts of devices and have distinctive black and copper colouring. 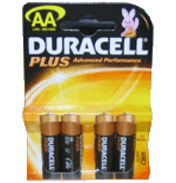 Whether you need AA, AAA, 9V, C or D then you will find them here and they are suitable for most household needs including for toys. 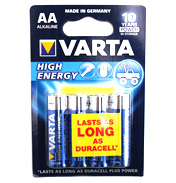 The most popular sizes are AA and AAA and these sizes were introduced back in the early 1900’s for the very first time and size D was even earlier in 1898 as a flashlight battery – amazing! 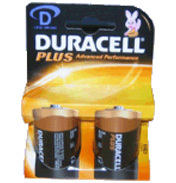 They have been updated and improved a lot since the early days though of course and Duracell is one of the most trusted brands there are on the market today. 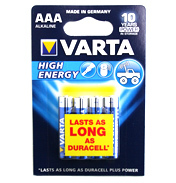 Perfect for clocks, radios, remote controls, smoke alarms (have you checked yours recently?) and torches.